The Salmo Watershed Assessment Project team, known as the SWAP Squad watch demonstration of how water flow is measured using a tape and meter. 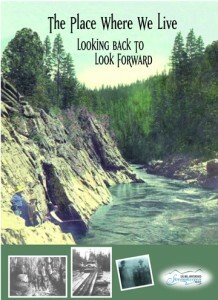 In response to interest shown in the Salmo River during a Forestry Transition Strategy meeting held in Salmo, BC in 1997, the Salmo Watershed Streamkeepers Society (SWSS) was formed. SWSS is a non-profit society that has been granted charitable organization status from the federal government. In its short history, the Salmo Watershed Streamkeepers Society has accomplished an incredible amount. We have been actively gathering information about the Salmo River, providing educational and career opportunities, promoting a stewardship message to our community and beyond, and spent many enjoyable days on the Salmo River improving fish habitat. 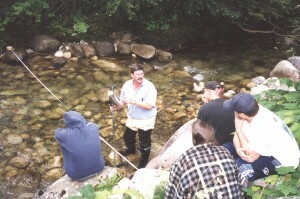 To understand and characterize the river, in 1999 SWSS hired local youth to complete a Salmo Watershed Assessment Project using “stream keeping methods”. In addition to mapping Watershed data, the SWAP squad, as the youth were affectionately known, interviewed community elders and documented their stories. This activity resulted in the book titled, The Place Where We Live: Looking Back to Look Forward. The stream keeping methods we use are accessible to any community and require minimal equipment. They also provide an approach to assess, protect and learn more about our local streams and rivers. In 1993, the Streamkeepers Handbook and Modules were developed by Fisheries and Oceans Canada (DFO). They are comprehensive training and method guides for volunteers to evaluate and monitor stream conditions. SWSS uses many of these methodologies but also partners with industry professionals for their practical and technical expertise. Partnering is a prime objective for SWSS. Sharing enthusiasm, knowledge, equipment and especially perspective, we have established good working relations with a number of private companies, government and research organizations and individuals throughout the Columbia Basin.